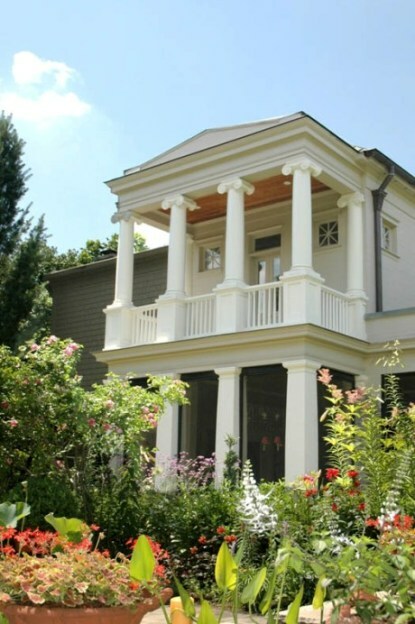 Ben Page of Page | Duke Landscape Architects & his wife, Libby Page, chose Chadsworth Columns when renovating the back of their historical home in Nashville, Tennessee. These columns are Authentic Replication Wood Columns. 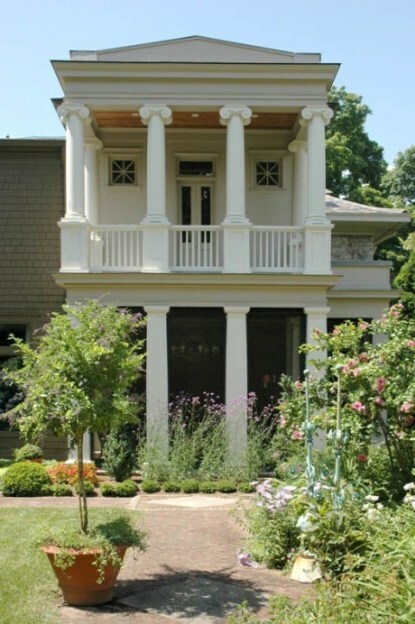 UPPER LEVEL: Plain, round, tapered columns with Greek Erechtheum capitals & Ionic (Attic) base moldings / plinths. LOWER LEVEL: Plain, square, tapered columns with Tuscan capitals and Tuscan base moldings / plinths. The above project correctly superimposed (stacked) the columns. 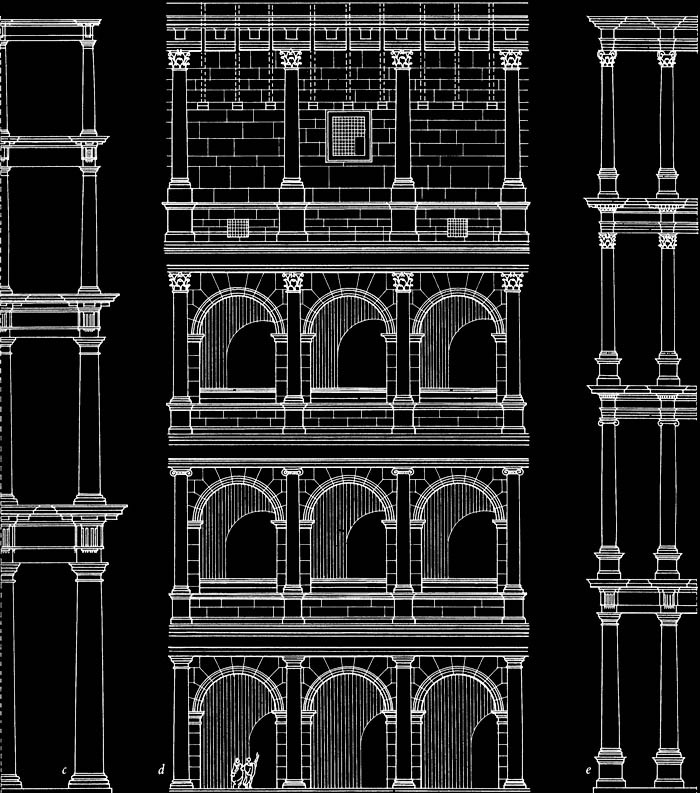 Superimposed: Utilizing the Orders of Architecture to define the stories of a Classical façade, through the stacking of columns in a hierarchical order. For larger façades, or when using only two orders – it is important to implement the primitive, simple Orders (Tuscan & Doric) on the bottom level, with the more decorative Orders (Ionic, Corinthian & Composite) on the upper level(s). 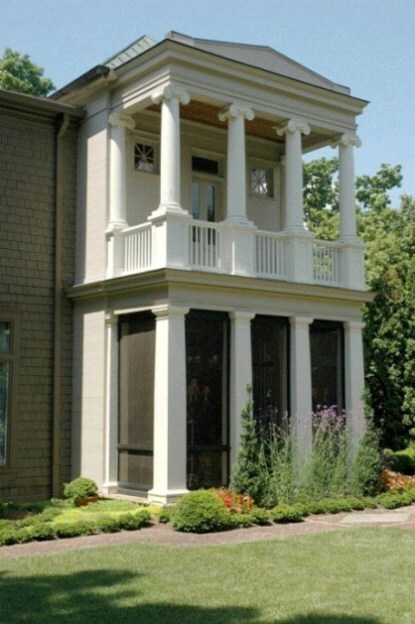 Correctly superimposing columns reduces the load-bearing weight upon the stacked columns, and the façade will be more aesthetically pleasing, as well as architecturally correct. A good rule to follow is the example of the Renaissance influence, which makes the top diameter of the lower column order equal to the bottom diameter of the upper column order. For Example: if the bottom column diameter is 12″ tapering to a 10″ top diameter, the column sitting on top of it should have a 10″ bottom diameter tapering to an 8″ top diameter. Correctly superimposing columns will help bear the weight of the structure as a whole. This entry was posted in Renovation Projects, WHO USES US? and tagged ben page, chadsworth columns, columns for upper levels, libby page, page duke landscape architects, stacked columns, superpositioning of columns, www.columns.com, www.pageduke.com by Chadsworth Columns. Bookmark the permalink.